Pls Note: Only applies to Android and iOS system, does not apply to windows system. It is not waterproof, please install in rainless area. IR Night Vision - Day or night, rain or shine, it allows you to take photography and record videos at any time. Video Doorbell protect your home in real-time, no matter where you are. Easy to set up, pair with your mobile by connecting Wi-Fi, compatible with iOS and Android. Video Doorbell comes with an innovative quick-release rechargeable battery pack, so you can charge your doorbell without moving the device. Generally, two batteries can work for 6 months. Sensor performance:Support automatic white balance, automatic gain control, automatic backlighting compensation.Communicate with visitors via two-way audio with noise cancellation. PIR Motion Detection：PIR body detection wake up.Detecting the slightest motion in front of the door. Get instant alerts when visitors press your Doorbell or trigger the built-in motion sensors. 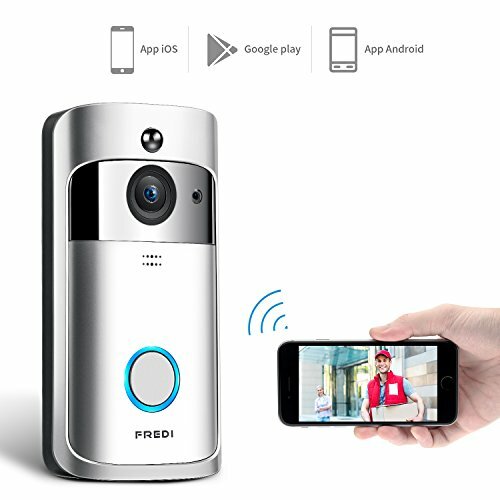 WARRANTY - 60days Free Warranty + Lifetime Technical Support.Please email us if you have any problems with the camera.We must be reply you as soon as possible.IF YOU HAVE ANY PROBLEMS, PLEASE SEND EMAIL TO ussupport@fredicctv.com MONDAY-SUNDAY, we will reply you within 24 hours. If you have any questions about this product by FREDI, contact us by completing and submitting the form below. If you are looking for a specif part number, please include it with your message.